There has been a long history of giant bird sightings in Pennsylvania. The term “Thunderbird” has been used to describe these generally very large, normally black or dark brown birds with massive wingspans. Not all of the descriptions of these flying cryptids however are the same. Some witnesses I have Interviewed in past years have stated that what they saw looked more like a giant bat. In recent months there has been a noticeable increase in reports of these mysterious flying creatures. The following is a brief summary of these reports that have come to my attention. I have received other such reports from the eastern region of the state but I have not been able to interview those involved. The man realized that the dark colored object he was seeing was not a small airplane but appeared to be a huge bird. As he watched, it glided towards the west and brushed the clouds at times. He never saw it flap its wings. 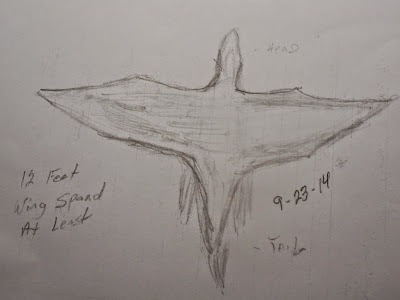 While it was difficult to judge the altitude of the creature, the witness estimated that the wingspan was about 15 feet across. The man wanted to get a better look so he ran into his house to grab a pair of binoculars. When he returned outside, the bird was continuing to glide and quickly moved out of sight. He never had the chance to observe it through the binoculars. Did an Experienced Bird Watcher observe a Thunderbird in Pennsylvania? When I received this call from the witness, it was apparent that he was still having difficulty dealing with the fact that he had observed something that he could not identify. The fellow had been watching and studying the birds of Pennsylvania as a hobby for many years. He knew that what he saw was very strange and he went back and studied his bird reference books before contacting me. 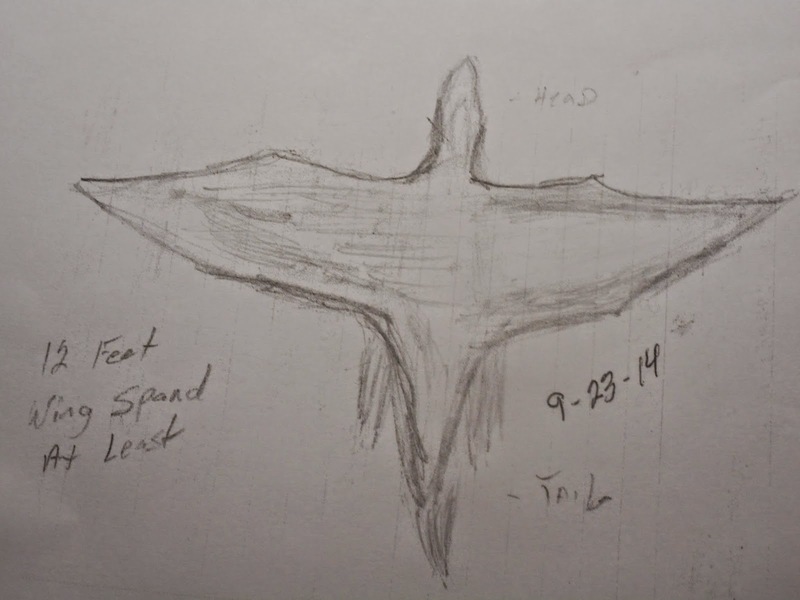 It was late afternoon on July 21, 2014, when the witness was driving through a rural area of Indiana County, Pennsylvania, that he noticed something in the sky that attracted his attention. In the distance, he observed what he first thought was a low flying small aircraft. That was until he noticed the wings were flapping very slowly. He soon realized that he was watching the largest bird he had ever seen. The gigantic bird was dark brown in color, and he could see a broad semicircular tail/rump area. The witness, who is very familiar with the birds in the state such as the egret, heron, crane and eagle, said that the wingspan dwarfed that of an eagle and he estimated the wingspan of this huge bird to have been longer than twelve feet. He watched the bird fly over the wooded area until it was lost from sight. The man stated that he was in a state of slight disbelief but estimated his total sighting to have lasted about 20 seconds. A note of interest is that there are a number of power lines close to the area of observation. Also, the location of the sighting is within a mile and a half of the Homer City power station. I have mentioned this before, but I have noted for years that many cryptid encounters as well as low level UFO sightings quite often occur in the vicinity of energy sources. I received a call from Roger Marsh a Scottdale resident and Editor of the MUFON UFO Journal reporting that he had observed a huge giant bird over that area. It was about 1:15 PM, while moving furniture, when the witness noticed directly up in the sky the biggest bird he had ever seen. Marsh was able to see the beak, body and wings of the huge flying creature that was dark in color. The most outstanding feature was the massive wingspan of the bird that was easily visible as it made wide circles in the mostly sunny sky. According to the witness, two men reportedly were overheard discussing at a local convenience store that on the same day they had also observed a Thunderbird over the area. A witness living near Jeanette was standing in his backyard during the afternoon when his attention was drawn towards the sky after hearing a strange sound. The man told me it was difficult to explain the sound but that it was a very unusual and loud animal sound similar to Rah, Rah, Rah. He commented that he would imagine that a dinosaur might make such a sound if they still existed today. As he looked up the sound was coming from a giant “very black” bird passing low over his property. The witness estimated that the body of the creature was 6 feet or more in length from head to the tail. The wingspan was the most obvious feature that extended to 12 feet or more in width. The witness commented reluctantly that what he saw looked more prehistoric rather than a normal bird. He also indicated that from what he could see from the wings it did not have feathers but that it was covered with skin like that of a giant bat. The man watched as the huge flying creature moved off in the distance. This observation took place only a couple of miles away from the location where another giant bird sighting was reported in March by another observer. It was late afternoon when two witnesses observed something in the distance over a group of trees near the community of Penn only a few miles from Jeanette. The observers watched as a helicopter moved across the sky. They were used to seeing such aircraft passing through the area but it was what was following that helicopter that drew their attention. They watched as a huge black flying creature followed close behind the helicopter. The bird appeared to be at least as large as the chopper and possibly somewhat bigger. For a short time it continued to follow the helicopter then circled several times over the trees before moving off over a hill in the distance. One witness told me she never expected to see a dragon in the sky, but that is what the huge winged creature looked like. (Note: This is the second report I have received over the years of a huge bird following close to a helicopter.) I went to the location to interview the witnesses who were able to give a detailed account of what they had observed. September 24, 2014-Irwin, PA-Strange noises from woods. This event interestingly occurred only a few miles away from Jeanette and Penn.. The witness was getting into his car about 9:45 PM that evening. The man parks near a heavily wooded area. He estimated that from 50-80 feet away he heard loud noises as if something large was snapping tree limbs. Then he heard a loud shrill sound coming from the woods that frightened the man. The sound he described was somewhat similar to the Rah-Rah-Rah sound that the witness near Jeanette had reported the day before. I went to the location with another investigator who had worked on these cases with me for many years to interview the witness and search the wooded area where the incident occurred. While no evidence was found in the woods, the witness appeared very sincere and was evidently quite frightened by his experience. It was during the late afternoon when the witness traveling on a rural road about 2 miles from the New Florence power generating station was startled when a huge bird passed about 15 feet over the top of his vehicle. The witness who is very familiar with local birds and says that this creature was much larger than any wild turkey he had ever observed. The witness stated that this giant flying creature was black or extremely dark brown in color. He could see its elongated neck that was similar to a goose as it moved across the road and was rising higher into the sky. The creature was covered with feathers, and the witness said the beak looked similar to a raptor. He was not certain but he thought the beak was light brown in color. He was amazed at its wingspan that he estimated was about 12 feet in width. He could not hear any sound which may have been drowned out by the engine noise. This sighting occurred about 16 miles from the location in Indiana County that occurred on July 21, 2014. If you have seen any of these flying creatures I am interested in communicating with you about your experience. NOTE: Stan Gordon will be our next guest on Arcane Radio...stay tuned!